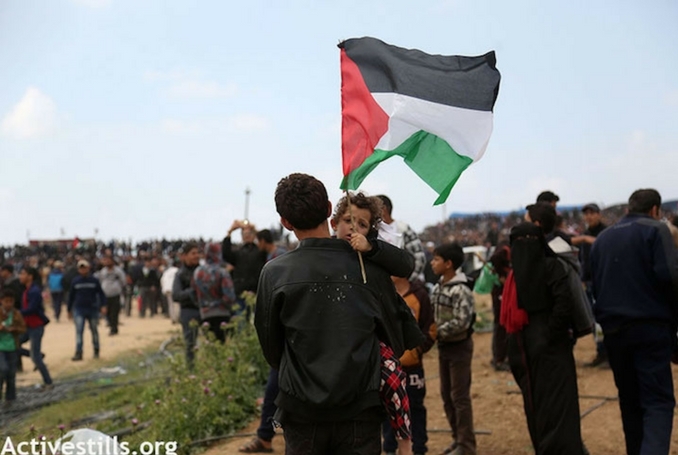 Palestinians in Gaza participating in the Great March of Return. One week after Israeli sharpshooters deliberately killed 18 unarmed Palestinian protesters captive in Gaza and critically wounded hundreds more on the eve of Passover — when we celebrate the ancient Hebrews’ escape from captivity — Israel has done it again. On Friday, they murdered nine and injured hundreds more inside Gaza for protesting. We in Independent Jewish Voices Canada grieve the killing of non-violent Palestinian protesters, people offering their lives before the world in a desperate cry from the heart. This ultimate sacrifice by Palestinians marching to the border knowing they will be shot, follows decades of living without freedom or hope inside the toxic Israeli prison called Gaza. We join Israeli human rights agency B’Tselem urging soldiers to disobey orders to shoot at unarmed civilians. Imagine if Canadian police again imprisoned Indigenous people in reserves, destroyed their homes, schools, workplaces, hospitals, power plants and sewage systems, then intentionally opened fire on them for protesting their plight, Further, imagine that our press blamed the dead for threatening our security. We would believe our country had lost its mind, and that our new rulers were determined to murder the remaining original peoples of this land. But Israel’s attempts to crush Palestinians’ dignity is completely enabled by Western “mainstream” media, political parties and Jewish organizations. Their irresponsibility is why we support the BDS movement to pressure Israel to respect human rights and obey international law. We are sick of this banality of evil by Israel’s defenders here in the West. Regardless of their rhetoric, their bankrolling Israel with trade and military accords, along with charities, maintains Israel’s subjugation of Palestinians. Israel’s slaughter of Palestinians reveals the hypocrisy of supposed Western-liberal enlightenment. Further, it violates and hollows out age-old Jewish teachings of morality. What moral lessons can Jewish youth be taught when our synagogues, our schools and our mainstream organizations honour Israeli soldiers for murdering captive Palestinian youth. It is clear that Jewish people are split over Zionism. Jews — especially the young — are turning their backs on Israel. Progressive Israelis are leaving, appalled by the fascist winds enveloping their country. The West helped create Israel as a homeland for the Jews it didn’t want, on land inhabited by Palestinian Arabs. It still props up Israel and bears full responsibility for today’s unfolding catastrophe. IJV can only hope our collective efforts in the solidarity movement for a just resolution of the Israeli-Palestinian situation are successful, and the illegal occupation soon ends. We urge other Jews to join us.